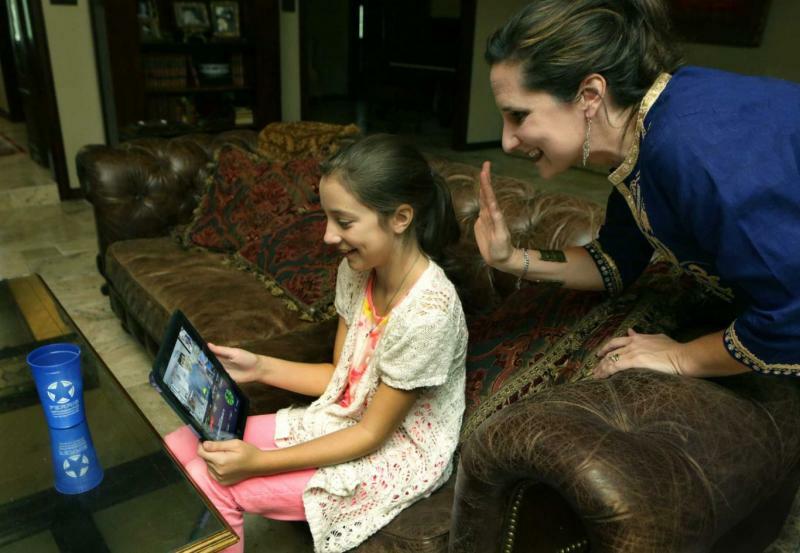 SAN ANTONIO — Sitting on her living room couch Wednesday morning, fifth-grader Rebecca Taylor beamed at the screen of her iPad. With each swipe and tap, she maneuvered a VGo robot a few miles away in her Leon Springs Elementary School classroom. 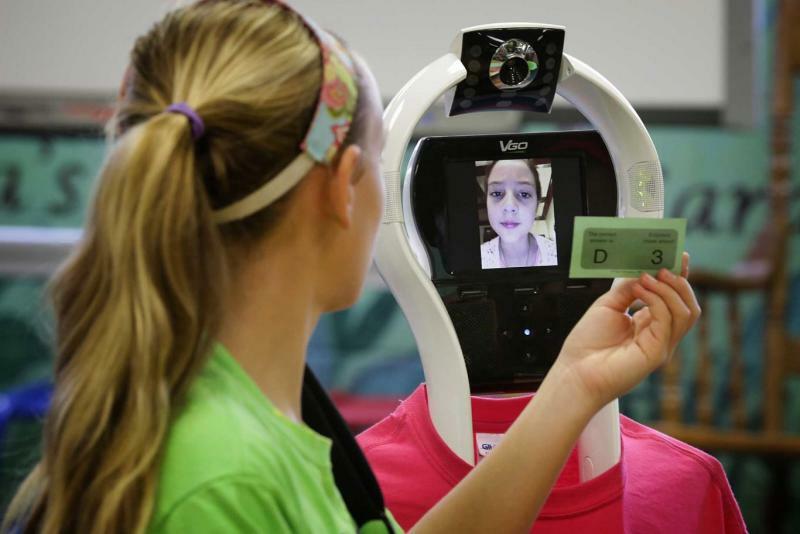 For the past three weeks, Taylor has been using the robot to attend classes via a video chat. The 4-foot-tall device is always clad in a school T-shirt, and she controls its every move, wheeling it backwards, forwards and around corners. Taylor, who was diagnosed with chronic pancreatitis four years ago, is often hospitalized for surgeries and has missed class for weeks at a time. Because the condition is rare and most of its treatments are experimental, Taylor and her parents need to travel to see specialists at the Mayo Clinic, the University of Minnesota in Minneapolis and The Johns Hopkins Hospital in Baltimore. For Taylor, a cheerful and sociable girl, the robot is more than a way to keep up with schoolwork. It connects her to her friends. “It was really exciting because I hadn't seen any of my friends in a long time,” Taylor said. So far, the robot is the only method that's allowed Rebecca to actively learn and socialize during her hospital stays, some of which last 10 weeks at a time, said her mother, Christyn Taylor. LeAnne Boddie, a third-grade teacher at Leon Springs, organized the robot loan as a way to keep Taylor involved during the three weeks before elementary school graduation, hoping Taylor would be well enough to attend the ceremony. "I wanted to be able to try to get her on campus, even if it's for a couple of days," said her teacher. "Even if it was just virtually, (it's important that she) have a connection and feel like she's part of the group and the community." The robot will be available for Taylor to use until next May. The school borrowed it from the Region 6 Education Service Center in Huntsville. 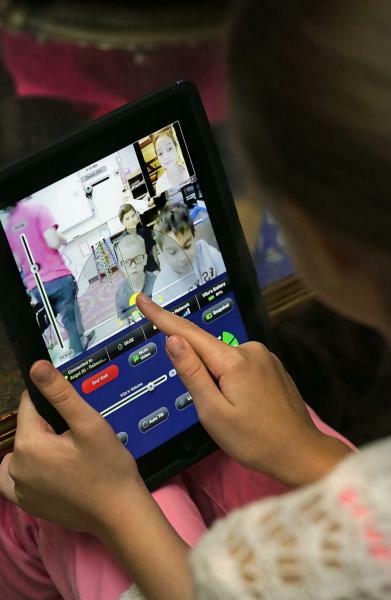 The robot is one of 21 that the Texas Education Agency regional office lends to homebound children, said Kip Robins, its information technology service manager. When Robins bought Region 6's first robot two years ago, it was the second one in Texas designated for use by homebound students, he said. Since then, Region 6's robot program has expanded; he believes it's the largest of its kind in the United States. Other TEA regions have acquired robots as well, but teachers and administrators still seek out Robins for the devices. District 20, which includes Bexar County, has two. Cindy Miller, an educational specialist at Region 20, said her office is seeking funding to buy 11 more for the next school year. Christyn Taylor recalled the day her daughter fainted at school and begged the nurse not to send her home. Images courtesy of San Antonio Express News photographer Bob Owen. See the full story here.